When you delete a SharePoint Site from Office 365, by default the deleted site will be retained in the Site Collection Recycle Bin for 93 days (Retention Period) and if you have deleted a site collection, then the site collection will be retained in Tenant Recycle Bin. The deleted sites are automatically emptied from the Site Collection/Tenant Recycle Bin after the retention period. You can restore a deleted site before this retention period time end. Consider that you have deleted a team site and you want to create another site with same name and site url. In this case, you can create a site with the same name but you can’t reuse the deleted site url until the deleted site exists in Recycle Bin. 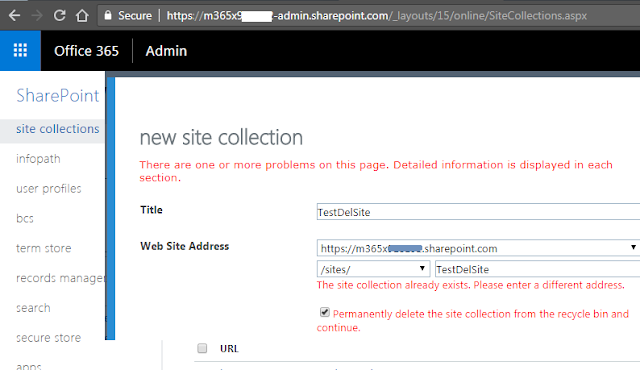 If you are creating another site collection from SharePoint Online Admin portal, then you will get the validation error The site collection already exists. Please enter a different address. . Under this error message you can also see the option Permanently delete the site collection from the recycle bin and continue., you can check this option and proceed to remove the deleted site from Recycle Bin and create a site collection with same site url. Consider that you have a Office 365 group that named as TestO365Group and the O365 group should have a associated team site (https://o365domain.sharepoint.com/sites/TestO365Group). If you delete this O365 group, it will also delete its associated site, both the group and site will be moved into Recycle Bin. Now you can create another O365 group with same name and email alias (group email address), but it will not create the associated team site with same url and it will place a numeric number after the site name in the URL (For example: https://o365domain.sharepoint.com/sites/TestO365Group2). So you have to remove the deleted site first from Recycle Bin to have the same group site url. Manually deleting the sites from Recycle Bin will be a tough task. So you can use the SharePoint Online Management Powerhsell cmdlet Remove-SPODeletedSite to remove the deleted sites from Recycle Bin. Before proceed Install and Connect SharePoint Online PowerShell Module, then run the below command to remove a deleted site. If you don’t know the deleted site url, you can use the command Get-SPODeletedSite to list all the deleted sites with Url.